There are three main considerations scientists need to focus on when looking at nanorobots moving through the body -- navigation, power and how the nanorobot will move through blood vessels. Nanotechnologists are looking at different options for each of these considerations, each of which has positive and negative aspects. Most options can be divided into one of two categories: external systems and onboard systems. External navigation systems might use a variety of different methods to pilot the nanorobot to the right location. One of these methods is to use ultrasonic signals to detect the nanorobot's location and direct it to the right destination. Doctors would beam ultrasonic signals into the patient's body. The signals would either pass through the body, reflect back to the source of the signals, or both. The nanorobot could emit pulses of ultrasonic signals, which doctors could detect using special equipment with ultrasonic sensors. Doctors could keep track of the nanorobot's location and maneuver it to the right part of the patient's body. Some scientists plan to control and power nanorobots using MRI devices like this one. Using a Magnetic Resonance Imaging (MRI) device, doctors could locate and track a nanorobot by detecting its magnetic field. Doctors and engineers at the Ecole Polytechnique de Montreal demonstrated how they could detect, track, control and even propel a nanorobot using MRI. They tested their findings by maneuvering a small magnetic particle through a pig's arteries using specialized software on an MRI machine. 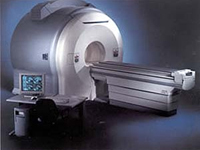 Because many hospitals have MRI machines, this might become the industry standard -- hospitals won't have to invest in expensive, unproven technologies. Doctors might also track nanorobots by injecting a radioactive dye into the patient's bloodstream. They would then use a fluoroscope or similar device to detect the radioactive dye as it moves through the circulatory system. Complex three-dimensional images would indicate where the nanorobot is located. Alternatively, the nanorobot could emit the radioactive dye, creating a pathway behind it as it moves through the body. Other methods of detecting the nanorobot include using X-rays, radio waves, microwaves or heat. Right now, our technology using these methods on nano-sized objects is limited, so it's much more likely that future systems will rely more on other methods. Onboard systems, or internal sensors, might also play a large role in navigation. A nanorobot with chemical sensors could detect and follow the trail of specific chemicals to reach the right location. A spectroscopic sensor would allow the nanorobot to take samples of surrounding tissue, analyze them and follow a path of the right combination of chemicals. Hard as it may be to imagine, nanorobots might include a miniature television camera. An operator at a console will be able to steer the device while watching a live video feed, navigating it through the body manually. Camera systems are fairly complex, so it might be a few years before nanotechnologists can create a reliable system that can fit inside a tiny robot. In the next section, we'll look at nanorobot power systems.